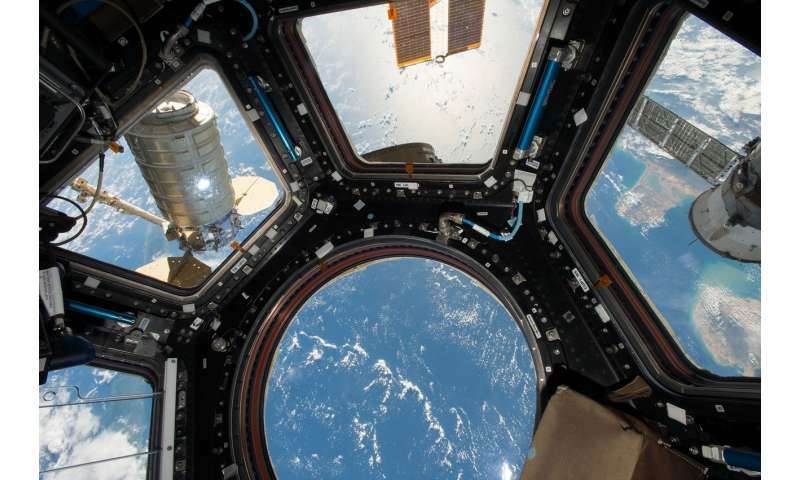 "Spaceflight can turn harmless bacteria into potential pathogens," says senior study author Prof. Elisabeth Grohmann of Beuth University of Applied Sciences Berlin. "Just as stress hormones leave astronauts vulnerable to infection, the bacteria they carry become hardier—developing thick protective coatings and resistance to antibiotics—and more vigorous, multiplying and metabolizing faster." To make matters worse, the genes responsible for these new traits can be readily shared among different species of bacteria, via direct contact or in the 'matrix' of slime they secrete—creating new bad guys, Agent Smith-style. "AGXX contains both silver and ruthenium, conditioned by a vitamin derivative, and it kills all kinds of bacteria as well as certain fungi, yeasts and viruses. The effects are similar to bleach—except the coating is self-regenerating so it never gets used up," explains Grohmann. "After 6 months exposure on the ISS, no bacteria were recovered from AGXX-coated surfaces," Grohmann reports. "For our part, we are continuing to analyze the antimicrobial performance of AGXX, most recently aboard the joint IBMP-NASA SIRIUS 18/9 isolation mission." Keep going down that road? Eventually we'll get super-mice inventing human-traps! Every solution causes two new problems. & revives an old problem you thought you had solved years ago. Like a zombie rising from it's grave. It seems useless, maybe even dangerous to continue trying to exterminate pathogens. Instead of wasting the resources it would take to achieve Perfect Sterility? Remembering. isolation didn't do one damn bit of good for the First Nations of the Americas & the Pacific from the plagues spread by the European savages. We need to concentrate on strengthening our internal & external natural micro-flora & micro-fauna to better compete against dangerous micro-organisms. We must learn equanimity & accept a conservative attitude of moderate stoicism. UV radiation is beginning to get attention as means to kill bacteria and virus on hospital surfaces. true Ben. Specifically UV C rays if I remember correctly. However, whatever survives to mutate & thrives in a radiated environment? Is not going to be your friend or mine. No Siree! Psst Ben, don't repeat what I'm about to tell you. Keeping it under your hat will save you having to kisten to a hell of a lot of whining from the panspermia cultists. "Ultra-Violet-C is continuously radiated, flooding across Space when the Sun is shining. Not at night of course. just as the holey babble insists. & this UV-C radiation is produced by every shining star across the Cosmos." Shhh. That was for Your eyes only! "All Day! All Night! Baryon!" True enough, and not a bad idea. But the immediate observation is that unless every single one of the bacteria die this risks evolving UV-immune bacteria. I will make the same observation about AGXX. And in fact there are statements in the article that hint at this.